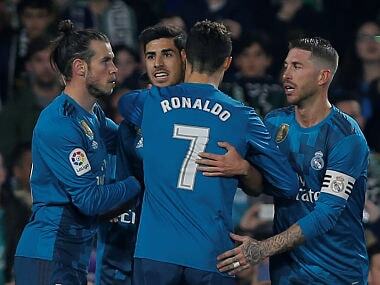 Seville: Man of the moment Marco Asensio scored twice and Cristiano Ronaldo was also on target as Real Madrid kept up the feel-good factor with a thrilling 5-3 victory at Real Betis in La Liga on Sunday night. Madrid had been 2-1 down at half-time in a fantastic game at the Benito Villamarin, but they came roaring back in the second half with Sergio Ramos, Asensio — who had scored the opener — Ronaldo and Karim Benzema all finding the net. 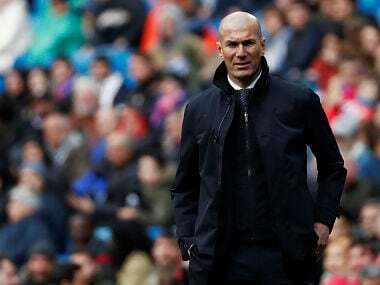 They survived a late Betis onslaught, and after their 3-1 Champions League last 16, first-leg win against Paris Saint-Germain in midweek, this victory confirms that Zinedine Zidane's side are looking better in La Liga now too. They remain fourth, a huge 17 points behind leaders Barcelona. However, this was their fourth win in five league outings, and they are back to within a point of third-placed Valencia with a game in hand to come at Leganes in midweek. "It was an end to end game, a bit crazy, but I like that. 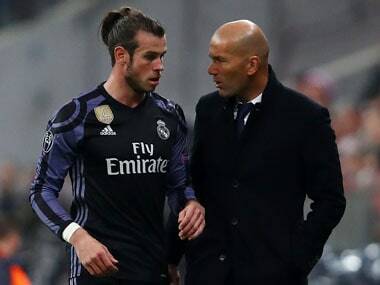 It shows that we had a proper opponent," said Zidane. "Betis were fantastic and controlled the last half-hour of the first half. But I'm happy in the end, and I prefer to focus on the five goals we scored rather than the three we let in." Asensio had come off the bench to set up the two late goals that allowed Real to beat PSG and he was rewarded with a start on Sunday in Seville, while Gareth Bale also came in as the likes of Benzema and Luka Modric dropped to the bench. Asensio duly headed Madrid into an 11th-minute lead after Antonio Adan had saved a Ronaldo shot, but Betis had won when the sides last met at the Santiago Bernabeu and they hit back brilliantly. Loren and Joaquin, the latter from a free-kick, both came close before Aissa Mandi headed in a Joaquin cross to make it 1-1 in the 33rd minute. It was 2-1 shortly after, as visiting defender Nacho could only help a Junior shot into his own net, and the home fans in the crowd of over 53,000 erupted. Real also saw Marcelo limp off in the first half, a potentially worrying sign ahead of the PSG second leg, and Zidane confirmed the Brazilian would find out the extent of his injury on Monday. Madrid recovered superbly after the restart, though. Ramos, whose Sevilla past always ensures a hot reception from the Betis fans, levelled with a bullet header from a Lucas Vazquez corner. Dani Carvajal then set up Asensio for his second and Real's third as the hour approached, and Ronaldo smashed in their fourth goal in the 65th minute. The Portuguese, supposedly in decline, has now scored 10 times in six games between league and Champions League. Betis may lack the consistency to properly contest a European place, but they do provide entertainment, and Cristian Tello set up fellow substitute Sergio Leon to make it 4-3 late on. 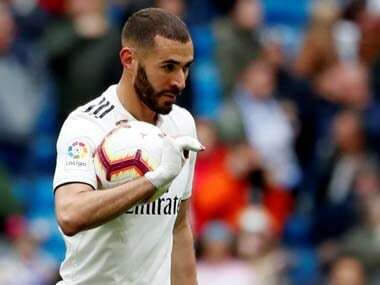 Benzema, on from the bench, completed the scoring at the death with a goal that will boost his confidence. Earlier, Kevin Gameiro came off the bench in the second half to score one goal and make another for Diego Costa as second-placed Atletico Madrid beat Athletic Bilbao 2-0. It was another clinical performance from Diego Simeone's side, who have now recorded four consecutive league victories, all without conceding a goal. They remain second, seven points behind unbeaten leaders Barcelona, who won 2-0 at Eibar on Saturday ahead of their Champions League trip to Chelsea. "We are not stopping, we are playing well at the moment, and we are enjoying ourselves," said Gameiro when asked about his team's pursuit of Barcelona. Atletico, who have conceded a paltry nine goals in 24 La Liga games this season, will hope to stay within striking distance of Barcelona before going to the Camp Nou in a fortnight. Villarreal are sixth after a 1-1 draw at Espanyol, while Real Sociedad beat Levante 3-0.